The ballerina holds multiple rings, or one special ring as an unforgettable proposal prop. The classic musical jewelry box gets a Steampunk upgrade with this lovely mechanical flower. Around a graceful ballerina, six intricate petals open and close in an elegantly fluid dance when you rotate the gear-like base. 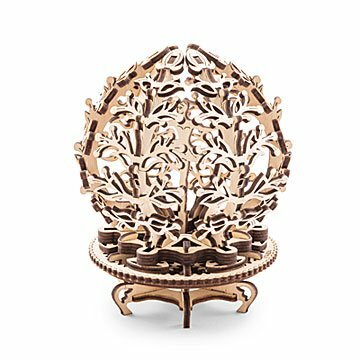 Making this unique jewelry holder is half the fun: The kit's 101 Baltic birch parts are laser cut, numbered, and accompanied by detailed instructions to build the clockwork blossom. The ballerina holds multiple rings as a distinctive addition to your dresser, or one special ring as an unforgettable proposal prop. The kit also includes a "Tree of Luck" base if you prefer a bracelet-holding option. Made in the Ukraine. Spent hours and hours trying to put it together and it it just fell apart. Very poor instructions. Put together with toothpicks. I don't recommend this for any age. Very poor design. My granddaughter finds things like this intriguing. So I am hoping that she enjoys putting it together and then has a beautiful item to display. Since she is a little ballerina herself, I find it to be very appropriate for her and very pretty. I loved this gift, my daughter attempted to assemble it the day after receiving it. A few pieces snapped, but we glued them together. Piece #4 was not mentioned in the assembly instructions, so it sat unused after assembly. It was inoperable at the end, so we are assuming that piece #4 was quite important in the rotation of the opening of the flower. It would be nice to know what went wrong so we can fix it so she can fully enjoy the gift.